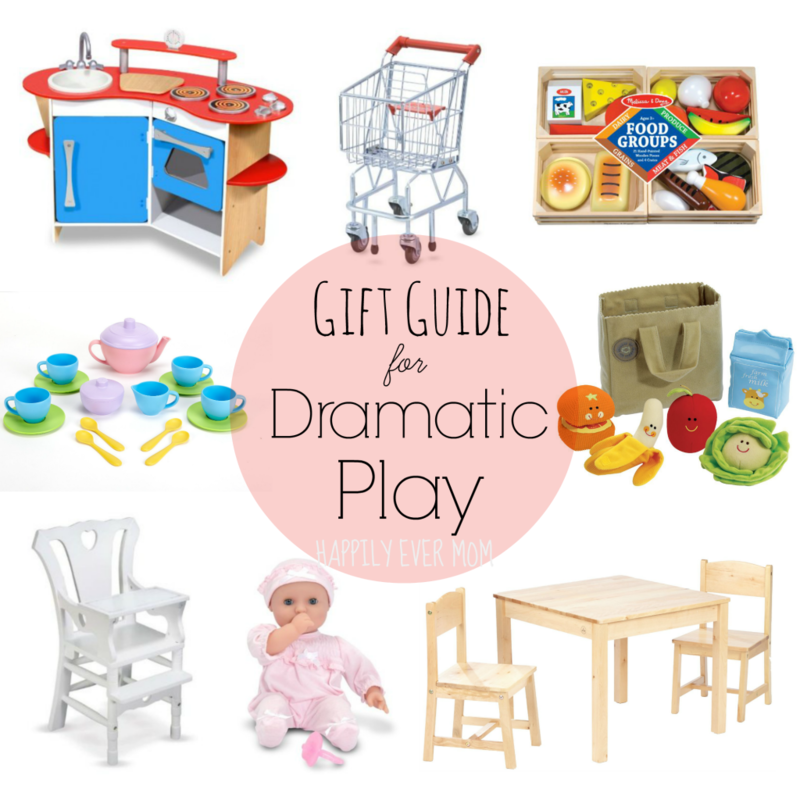 Gift Guide for Dramatic Play: For Preschoolers and Toddlers! My daughter is a dramatic play lover! So, it’s no big surprise that we’d come up with a gift guide for our favorite ways to play grocery store or dolls or tea party. These are not only our favorite family toys, but ones that have held up when I was teaching preschool, too. But, most of all, we love these toys because they will inspire hours and hours of play! This post contains links to Amazon – thanks so much for the support! When you walk into a classroom, you will likely see one or several small tables with chairs. 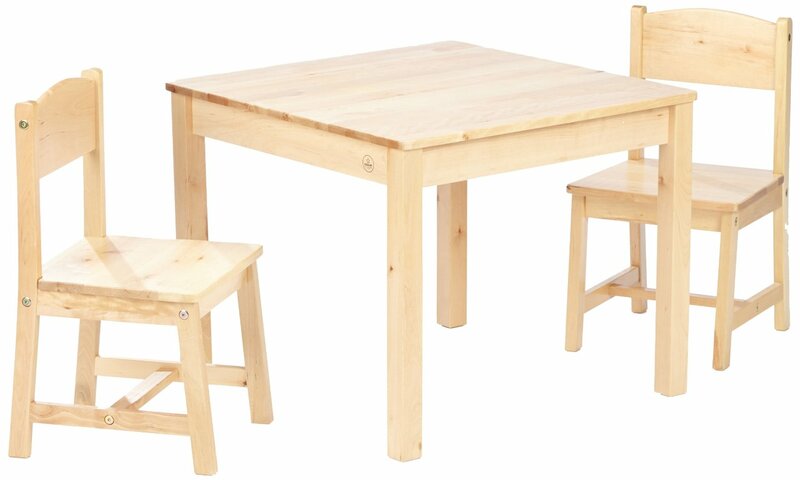 It’s so great to have a table that is at a child’s height, where their feet can touch the ground (*almost* for some! ), and where they can engage with materials easily. 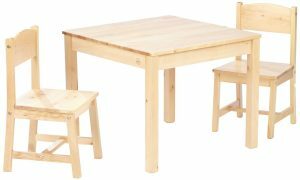 This is the table we have: KidKraft Aspen Table and Chair Set – Natural . 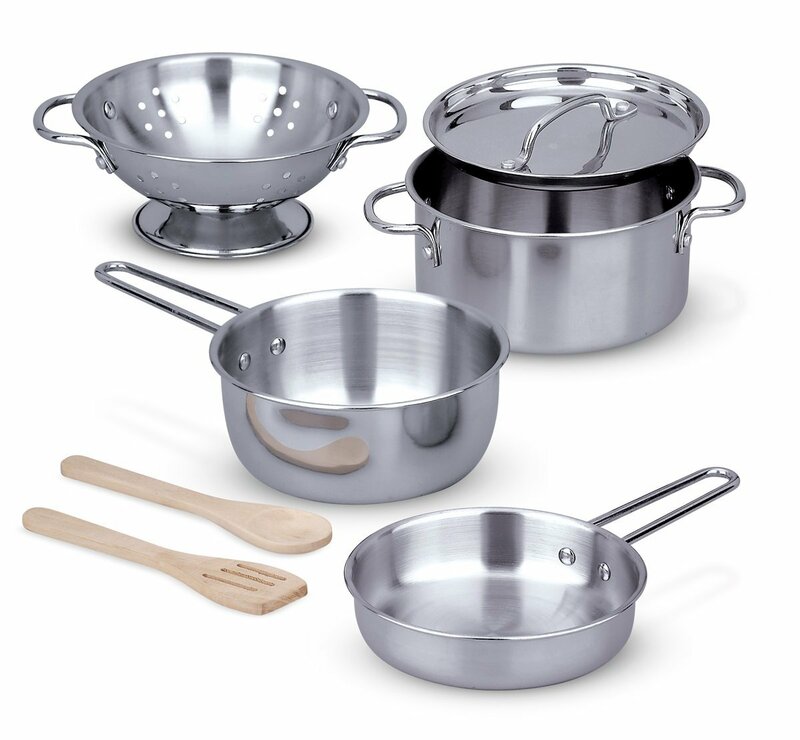 We use it for art, for setting up and cooking pretend food, and for eating real food when we have play dates. In my opinion, it is worth investing in a great table like this one so that it will last throughout the years – especially if you have more than one kid or if you have kids over frequently! 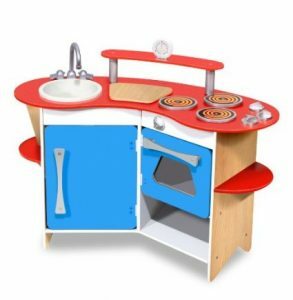 Finding a great play kitchen is a must for the dramatic play lover! We were able to snag this great Melissa & Doug Cook’s Corner Wooden Kitchen when it was on sale a couple years ago. It was for my daughter’s second birthday and she has grown into it nicely. It tucks in a corner because it’s slightly curved, which I love, and it has a really sleek look, which my husband loves! 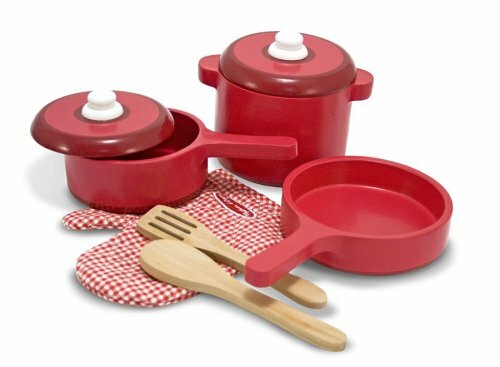 I drooled over this Melissa & Doug Deluxe Wooden Kitchen Accessory Set for a year before my sister in law finally bought it for my daughter (*thank you*). 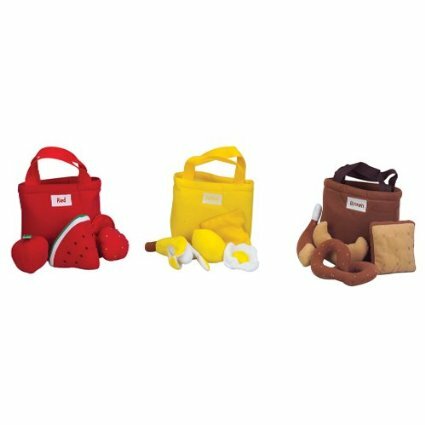 L loves it and I think the wooden spoons and oven mitt are just adorable. Not only that, but my daughter actually uses the mitt to get *hot* things out of the oven, so she is practicing safe habits! I am now drooling over this set of Melissa & Doug Let’s Play House Pots Pans Set because it’s made from metal which makes it a different sensory experience (it makes a nice sound – or, not so nice sound!). And, that kid-size strainer is enough to seal the purchase for me! If your looking for a green alternative for your new play kitchen, check out this Green Toys Tea Set that we have. My daughter loves it! She uses it in the bath and the sand box, too. Because it’s made from recycle milk bottles, it’s strong and made to last! 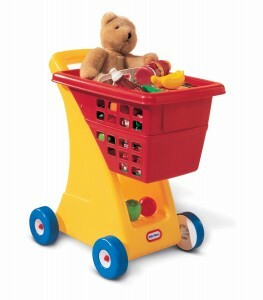 We have this Little Tikes Shopping Cart – Yellow/Red from my daughter’s first birthday. It really helped her when she was taking her first steps, but now she runs around the house with groceries piled in the cart. 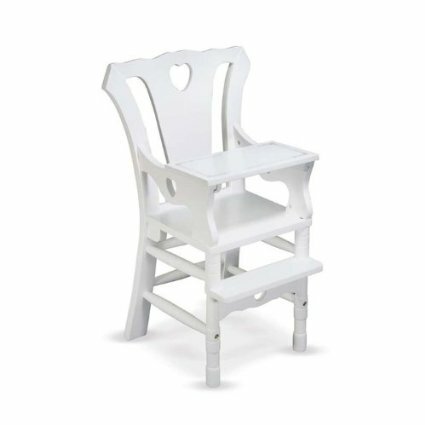 I particularly love the little shelf space underneath the basket and that my daughter can hold her baby dolls and animals in the baby seat. 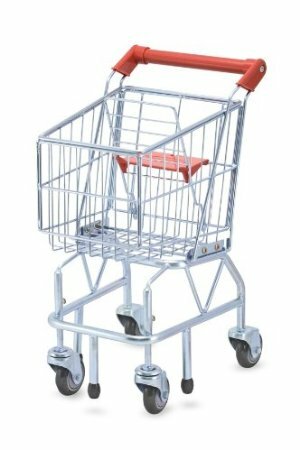 If you prefer metal, this is an adorable alternative: Melissa & Doug Shopping Cart . I love this one because the wheels swivel which makes it easy to maneuver around the house! 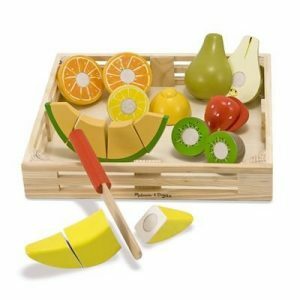 This Melissa & Doug Cutting Fruit Set – Wooden Play Food was our first set of food for dramatic play. My daughter started using it in her classroom as young as one year! I was amazed at how she tried to cut the food at that young of an age – what great fine motor skills! 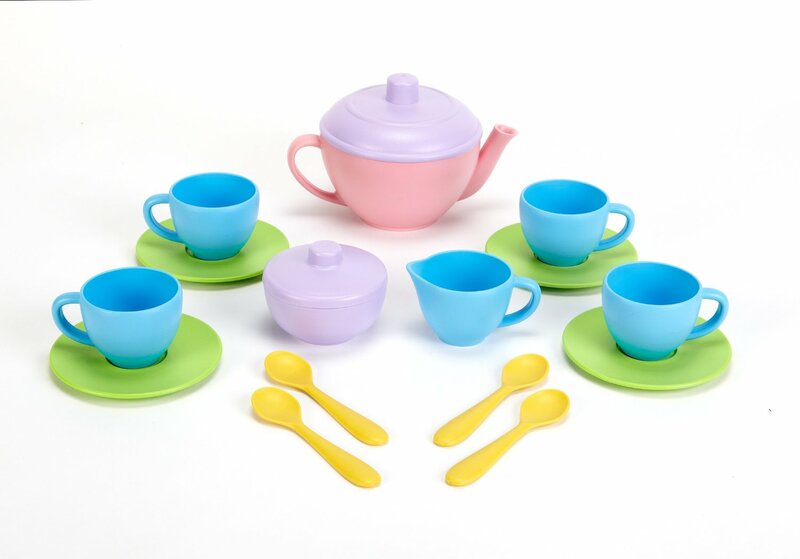 She now cuts the food with ease, but these are still a staple in our dramatic play kitchen. Bonus: we use the wooden knives to cut play dough, too! We don’t have these in our home, but I loved them when I was in the classroom. 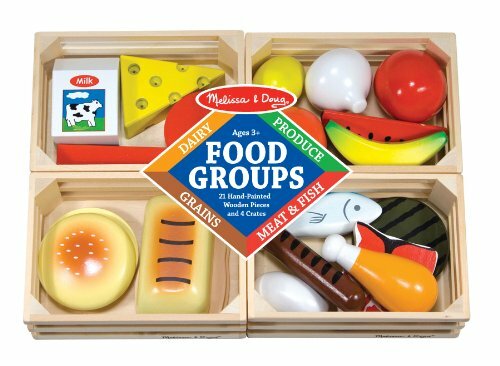 These Melissa & Doug Food Groups come in little boxes, so you have built in storage, and it helps children learn the basics of the food groups. Whether your child eats them or not, I think having extra Melissa & Doug Playtime Veggies is so important. 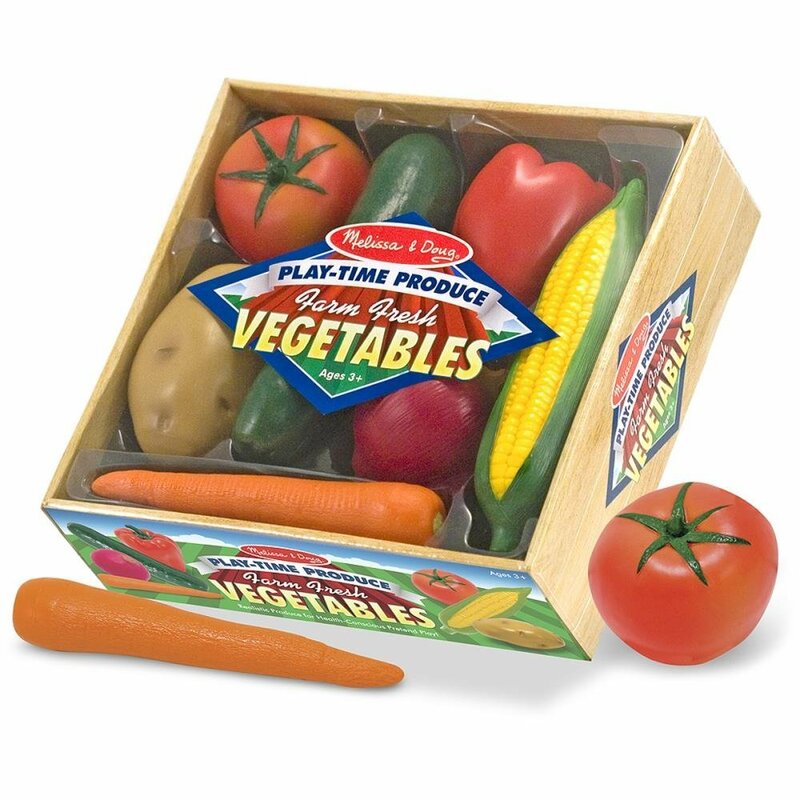 The more time kids play with and get exposed to vegetables, the better! Do you have multiple ages in your house? I do! 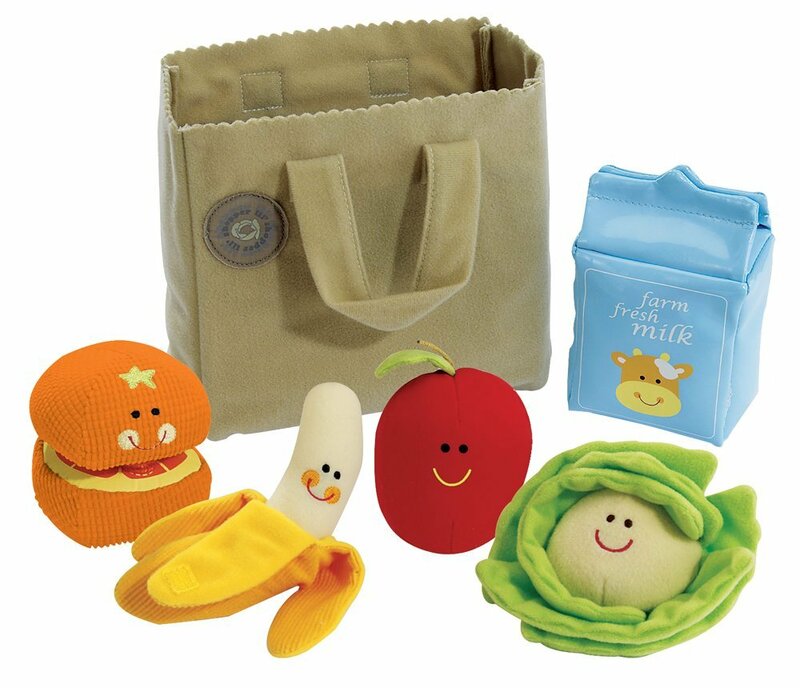 And, the Earlyears Lil Shopper Play Set is perfect for baby as well as older kids. We often give them for gifts to babies and toddlers. I adore the little bag it comes with and that the banana actually peels! I don’t have these Soft-Sorting Food Bags , but it was something that I always admired in other classrooms. In addition to great dramatic play, the bags and color coded food lend themselves to sorting as well. It makes for easy clean up and storage, too! Grab this great set of Melissa & Doug Top This! Role Play Hats, Brown/Black or, if you have a little lady in your life, consider these Melissa & Doug Terrific Toppers Dress-Up Hats, Pink/Purple . My Preschoolers always loved wearing a great hat in the classroom! 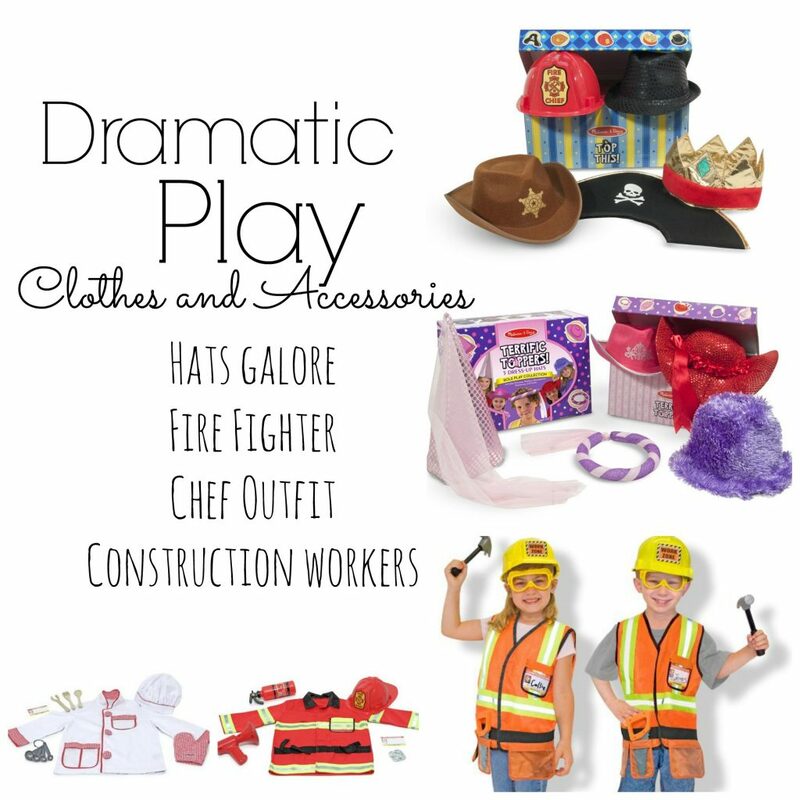 Another coveted item in the classroom was our Melissa & Doug Fire Chief Role Play Costume Set . It comes with really great accessories, too, like the fire extinguisher! Do you have a little chef in the making like me? I’m drooling over this Melissa & Doug Chef Role Play Costume Set for my little lady! Lastly, the Melissa & Doug Construction Worker Role Play Set is great for my son or for my daughter. The goggles that come with them are great for science experiments, too! 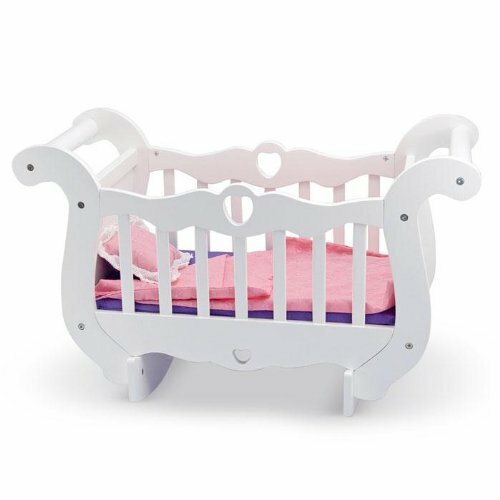 If there’s one thing that I’ve learned about having baby doll cribs in the classroom, it is that children will always climb inside them – no matter how small the crib! 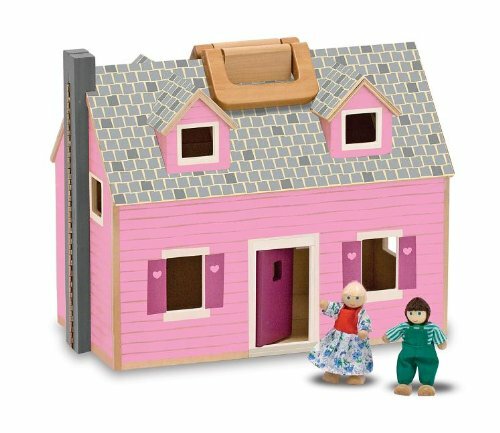 I love our Melissa & Doug Deluxe Wooden Doll Furniture Crib because it rocks side to side and it is build so well that my daughter can still safely climb into it! My daughter’s pick! 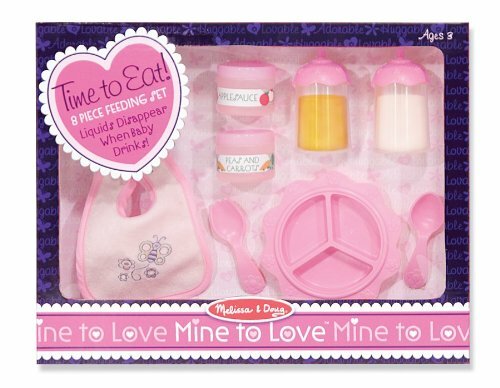 L picked this Baby Feeding Set out while we were at a toy store. I love that it has everything my daughter needs to feed her babies while I feed her brother! I think this is a great alternative to the grocery cart if you don’t want too many things that roll around in the house. 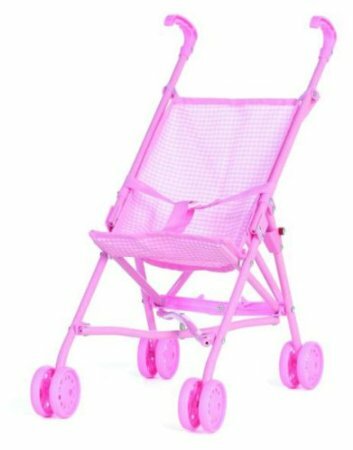 This Doll Stroller is great because it breaks down just like a real umbrella stroller! I sewed a kid-sized diaper bag for my daughter the afternoon before I went into labor (yes, I went into natural labor that night!). This Doll Diaper Changing Set is a great alternative if you aren’t motivated by insane nesting like I was! I love the accessories as well. It’s perfect for an older child when a new baby is on the way! Lastly, a nice Baby Doll for all the great dramatic play accessories. Having lots of baby dolls was essential in the classroom! My daughter absolutely loves playing with her babies especially since we had a second child. The first thing my daughter wants to play with in the morning is this Fold & Go Dollhouse . It’s perfect for our home because we don’t have a lot of space and it folds up nicely to store on a shelf. This is her number one used toy right now! 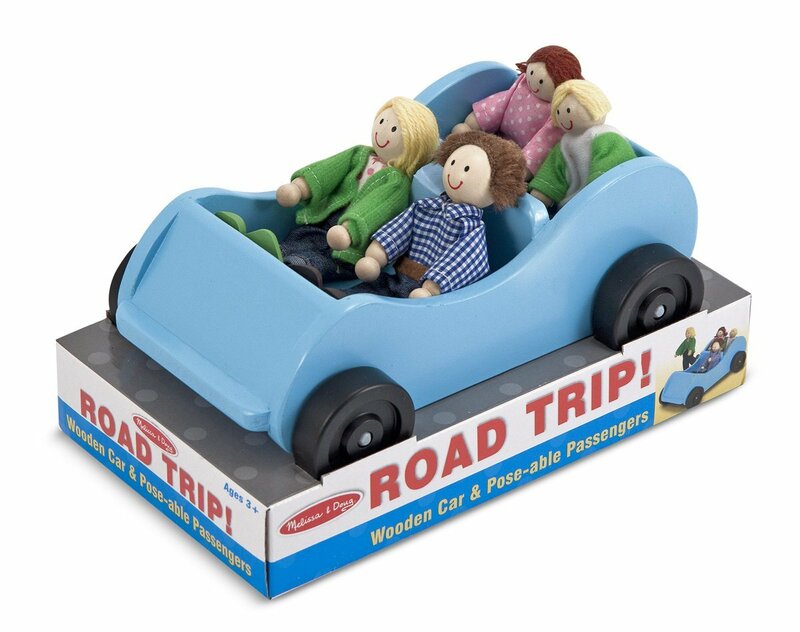 We’re hoping to add some people to our doll house soon with this Wooden Car and Pose-Able Passengers Playset . Plus, they’ll be able to drive around as well! 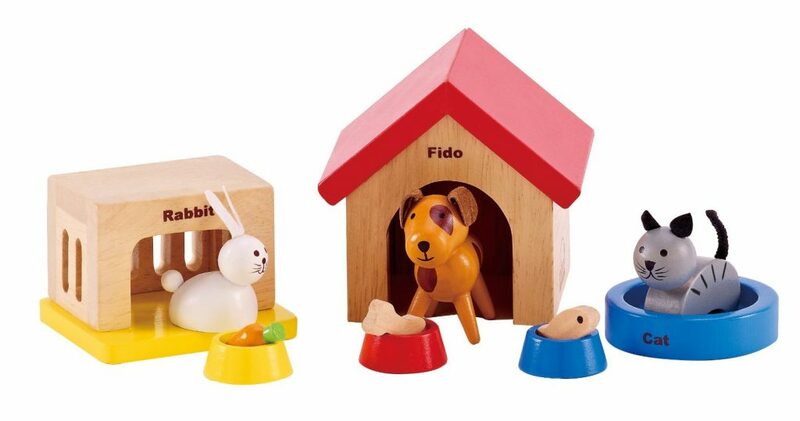 Since we just added two cats to our family, I’m in love with this Family Pets for the dollhouse from Hape! So adorable! My daughter will be drooling over these, but be careful of those small accessories. 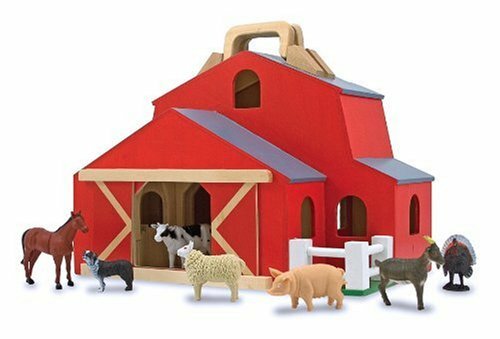 If you don’t want a play house and you would rather have something gender neutral, this Fold & Go Barn was always a big hit in the classroom. Again, it folds up, but I like this size as opposed to the smaller sized farm house because of the sliding front doors. The kids LOVED those doors in the classroom! Not happy with a house or a barn? 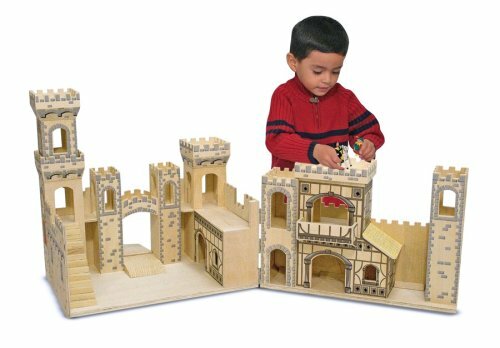 This Deluxe Folding Medieval Castle is always a hit with everyone in the classroom! 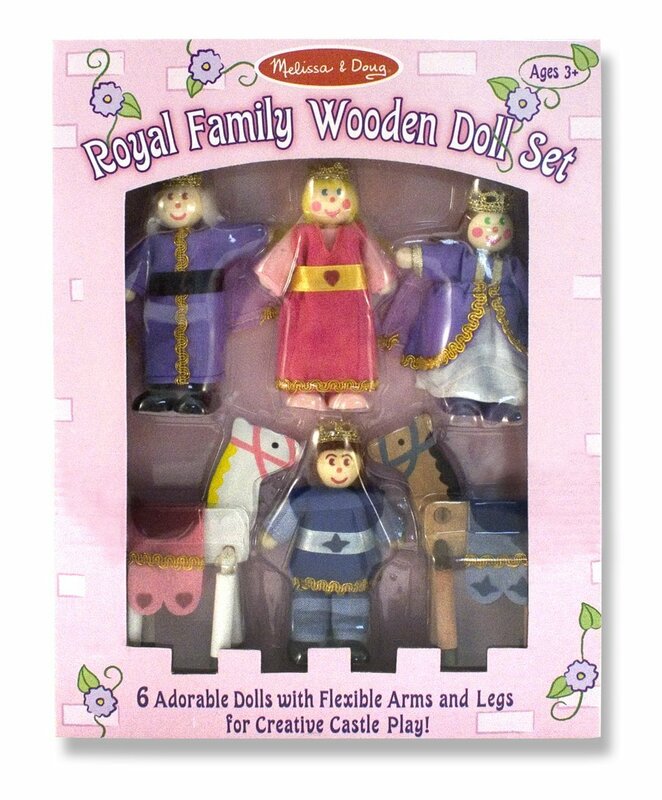 Pair the castle with the Royal Family Wooden Doll Set and you’ll have fun for hours! 🙂 Well, I mean the kids will have fun, but I do have to say that I played with those horses quite a bit in the classroom! Whew! That’s our guide for everything dramatic play! Whether you have babies, toddlers, or preschoolers, these materials will grow with your kids. Now…after all of that writing and reviewing of toys, I’m off to buy some more things for Christmas!